We are celebrating the lives of all Veterans by going on a motorcycle ride! 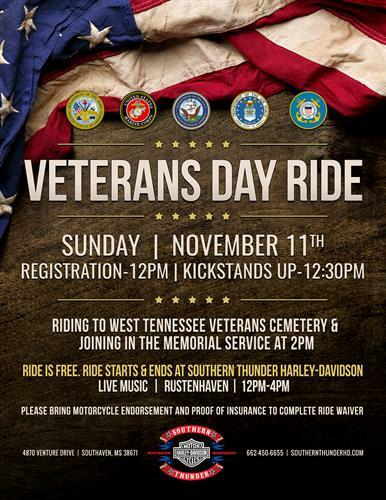 This self-guided ride begins and ends at Southern Thunder Harley-Davidson for live music by Rustenhaven from 12pm - 4pm. We will be riding to West Tennessee Cemetery and joining in the memorial service at 2pm. You and all of your friends and family are invited to join us in this celebration of life to honor the men and women who have served in the United States Military. *Must have motorcycle endorsement & proof of insurance to complete ride waiver. Weather Permitting.